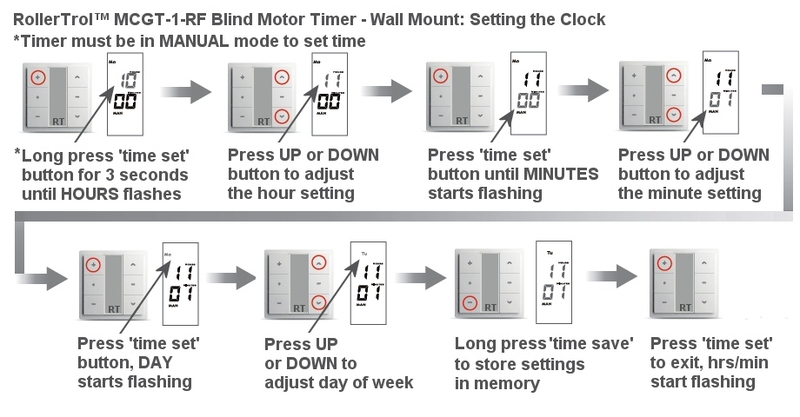 In part 1 of the blind motor timer instructions we discussed how the MCGT-1W-RF wireless wall mounted timer can be used to activate our radio equipped blind and shade motors using RF (Radio Frequency). In part 2, we will become familiar with the layout of the controls and features of the display. At this point the battery should have been inserted into the battery compartment, which will power up the timer unit. You should see some characters on the LCD display, as shown in the picture on the right (the actual characters may be slightly different). low battery warning indicator only appears if the internal button battery is getting low. The event memory settings will be retained when you change the battery, if you change the battery within 1 minute and do not touch the metal clip on the battery holder. The day of the week is shown in 1 of the 7 blocks allocated for this purpose. The label HOURS (and MINUTES) flash once per second in normal operating mode. The hours character display reads from 00 to 23 (24 hr clock). 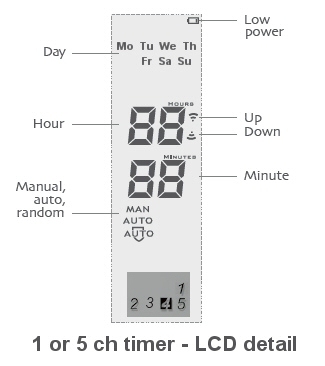 The minutes character display reads from 00 to 59. The Up and DOWN symbols show motor direction (both visible if stopped). The operational mode display reads Manual, Auto, or Auto (random), depending on selection. The channel display only appears on 5 channel timers. Manual (MAN on display). This mode acts like a regular wall switch. Automatic (AUTO on display). This mode will activate shade motors according to programmed times. Automatic Random (AUTO with graphic on display). This mode activates blind motors according to programmed time events, adjusting the time by a random amount. In the Automatic Random mode it will activate blind motors according to the programmed time events, but it will adjust the activation time by somewhere between 15 minutes before or after the actual programmed time. The first step for setting the clock is to make sure it is in MANUAL mode, as per the settings in step 2 above. To enter the clock setting mode, hold the setting button down for 3 seconds (aka long press), until the HOURS display starts flashing, then adjust it to the current time. Press the 'time set' button to cause the MINUTES to flash, then adjust to current time. Press the 'time set' button again to cause the DAY of week display to flash, then adjust to the day. Long Press the 'time save' button to store the time setting in memory. It will flash the entire display 3 times, then stop. Press the 'time set' button to exit the setting mode. The small HOURS and MINUTES labels will flash once per second, indicating normal operation mode. This completes the time setting procedure; the next article (part 3) will discuss assigning a motor to the timer.